With the start of SolidWorks World 2010 now officially 1 day away, I’m finalizing my schedule, planning my coverage, and pondering just what exactly we might see at the biggest MCAD event in the industry. One curve ball has already been thrown my way as my 6:15am flight for tomorrow morning was canceled. I am now booked on a little later flight which will put me getting to Anaheim between 4:00 and 5:00pm rather than 11:00am. The weather here in Huntsville (Alabama) is questionable tomorrow morning with some freezing rain possible…so I’m hoping for the best and my re-booked flight will leave on time safely. For the fourth year in a row, I’ll be covering SolidWorks World as a member of the “Blogging Press”. I’ve got a few new devices at my disposal this year that will allow me to bring a little more of the conference experience to YOU! Having my HP Mini 110 should help me shuttle around from place to place without having to look for a charging outlet and will allow me to take more “direct notes” during the sessions and events. I’m also going to have a Flip Video Ultra HD camera ready to roll at all times! While I can’t take videos during certain events, I plan to try and show more “behind the scenes” type stuff by talking to Users, SolidWorks employees, and Solutions Partners. The event itself is shaping up to be as big or perhaps bigger than any other SolidWorks World. James Cameron is one of the highest profile speakers to date (Richard Branson was pretty darned good as well). As usual, the preview of the next version of SolidWorks is certainly going to be on most everyone’s mind as they arrive at the conference. This subject gets me thinking about my trip to SolidWorks in August of 2009 for the Blogger Press Event. I couldn’t help but notice just how “giddy” Jeff Ray was in our meeting with him every time he talked about the new things that the R&D group were working on. That thought has stuck with me in the months since, so I’m especially anxious to see what the folks in Concord have in store for us in the coming years. So, now I’ll open it up to you guys and gals that are going to be reading all the coverage of the event across the net. 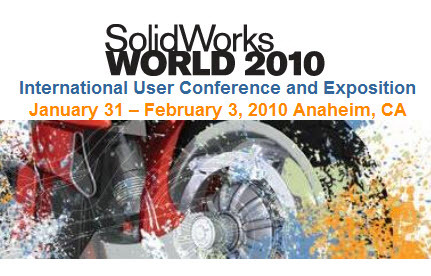 What type of things are you most interested to see discussed or reported on from SolidWorks World 2010? Leave your comments here and help shape the coverage! Stay tuned….much more to come soon!! I'm so thankful for dragging such an important topic to our attention, that's the kind of staff we need to know nowadays. How'z your experience Ricky in covering such a big event? Hope it was awesome. WINDOWS 7 DIGITAL DOWNLOAD,LOW PRICE+FREE SHIPPING!